Now that I’m getting back into things, I wanted to start off with one of my all time favorite beers. Stone Brewing “Ruination” Ipa. But this is the 10th Anniversary limited release, and let me tell you, it is one hell of a beer. Yes, I was ecstatic to see Stone’s Ruination 10th Anniversary at my local beer store and in this crazy state, I purchased 7 bottles. Why this many? I just knew it was not going to let me down. The minute I popped the cap, the tropical aroma shot out, hit me dead in the face. I liked. Pouring this poem of a beer, the color was a nice amber that was framed with a nice hue of orange. Thin lacing and nice solid head. The smell? Tropical smash in the face, citrus and juice. I get a tinge of watermelon rind as well. Can’t wait for the taste. Was it what I expected? But of course! Everything I look for in my “perfect” double ipa was there. Tropical, citrus, dank and sticky. The bitter is there when you take that first drink, but it goes into this smooth, sweet mouth-feel quickly. Almost like wading from the cold part of the swimming pool, to the warm. That bliss at arrival. The 10.8% hits you quick, but it’s hidden extremely well. 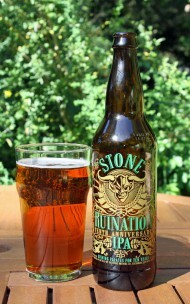 Does Ruination 10th Anniversary still continue its “ruinous” path on the palate? Ruination IPA 10th Anniversary- American Double| ABV 10.8% | $7.99 for 22 oz.